Our day started when we meet in Menomonee Falls and took a leisurely drive through the rolling hills and twisty roads of the Northern Kettle Moraine forest on our way to the racetrack. Arriving at the track we made our way to the Mazda Owners Corral where we meet fellow Mazda owners from around the Mid-West and discussed the activities planned for the day. 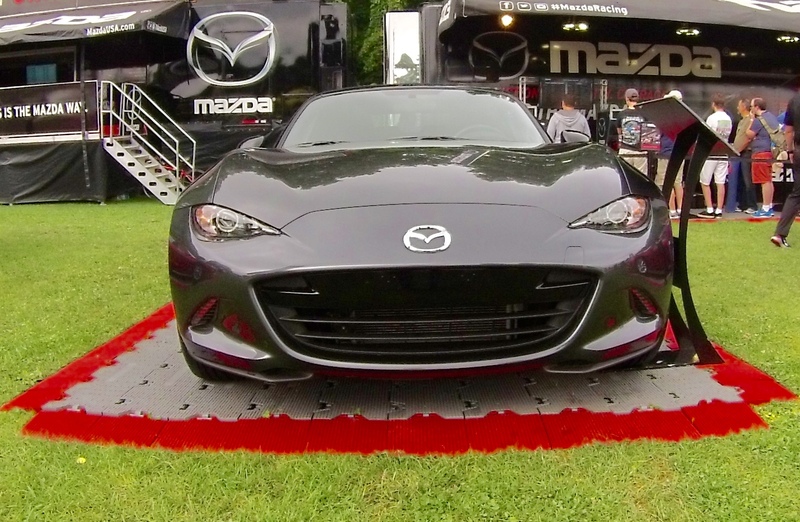 We stopped in at the Mazda Owners lounge where all you did was show them your Mazda key and could join in on the fun. There was a driving simulator setup with the Road America road course you could play with, the lounge itself was air conditioned with couches, big screen televisions, free refreshments and to top that all off we were invited to ride over to the go-kart track where Mazda had a small road course set up. Once you signed a waiver and took a Breathalyzer test we could test-drive any or every vehicle Mazda makes on the track, and when the racing was done for the day we were invited to go back to the lounge area for a cook out. The racing was of course just great. We got to see the new Ford GT (Yea I know. It’s not a Mazda. But still…) chase a Corvette through Canada Corner, and we also watched one of the Mazda prototypes set the fastest time of the weekend for the pole position for Sundays race. All and all, a great day at the track. The car below got the pole position for the race on Saturday.